"The worst storm I have ever seen is approaching Portland and the Willamette Valley right now," meteorologist John C. "Jack" Capell warned listeners via radio on the evening of the 1962 Columbus Day Storm. So opens A Deadly Wind, in which author John Dodge uses research and interviews with survivors of the storm to paint a picture of the event, sharing how the storm shaped the lives of Oregonians. Today on the blog as part of University Press #TurnItUP week highlighting local publishing, John shares his findings from a different side of the storm’s history: how the event affected different age groups psychologically. Young children rushed outside to the let the powerful winds propel their bicycles or lift them off their feet in fanciful flight. Friday night commuters drove home at the peak of the storm, mindless of falling trees, downed power lines and debris slicing through the air. Families huddled in their living rooms in front of single pane picture windows that bowed and exploded in gusts of wind. Homeowners ventured outside as the winds howled, determined to prop up and protect trees, patios, roofs and antenna, often in vain, and at great risk. 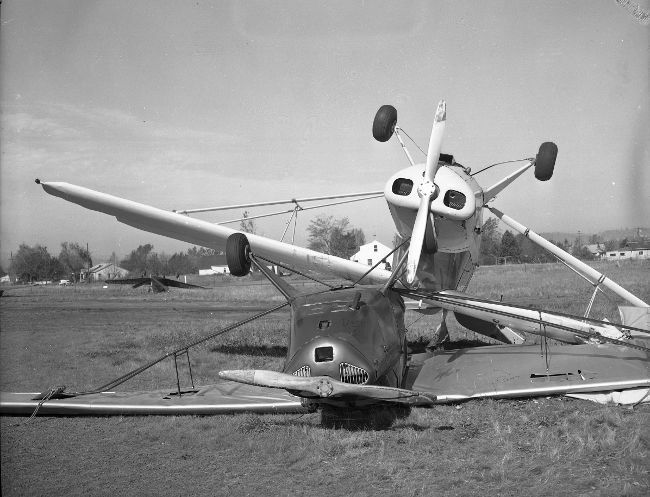 Photograph of Kelso Airport in Southwest Washington Courtesy of the Cowlitz County Historical Museum, Kelso, Washington. In hindsight, much of the behavior at the height of the 1962 Columbus Day Storm was naïve, impulsive and ill-advised. But the residents of the Pacific Northwest had no frame of reference, no experience to guide their actions in the face of an unprecedented and deadly windstorm. Dr. Ralph Crawshaw, a Beaverton, OR.-based psychiatrist in 1962, studied the reactions of different age groups of storm survivors. He found that young children in the absence of a parent exhibited very little fear. He flew past his house, but was brought back to earth by the powerful sight of his neighbor’s livestock watering tank as it flew through the air and crashed into a nearby fence. “I decided I better go home,” he recalled. Photograph of a crushed car in Portland. Courtesy of Oregon Historical Society. Teenagers and young adults as a group confronted the storm head-on, shielding themselves with a sense of immortality. At the heavily-wooded University of Oregon campus in Eugene, students gathered outside in an excited group, enjoying the spectacle of the storm as trees fell all around them and power lines glowed with short circuits. Many teenagers hopped in their cars at the height of the storm to visit friends or witness the damage in their neighborhoods. “There was much socializing in this age group, for the exhilaration needed to be shared,” Crawshaw said. Crawshaw found numerous examples of adults trying to protect their property as the storm raged. Bill and Carolyn Baker were living in north Seattle, WA. She was nine months pregnant when the storm struck. At the peak of the storm, her husband climbed on the roof to reattach the television antennae. “I was terrified that my husband would be blown off the roof and killed, and my child would be fatherless,” she said 40 years after the storm. Baker survived, but Lawrence Parrie, who was stationed by Sand Point Naval Air Station in Seattle, was the victim of tragic irony. He waited until the storm had passed Saturday morning to climb on the roof of his three-story barracks to repair a TV antennae. He slipped and fell to his death. The storm struck the Portland, OR. region just as Friday night commuter traffic was beginning to build. Commuters heading home would have been better served riding out the storm at their workplace, Crawshaw noted. “However, they undertook harrowing trips home through flying debris, driving over downed high-power lines and searching out devious ways to get through the roads blocked by fallen trees,” the psychiatrist said. 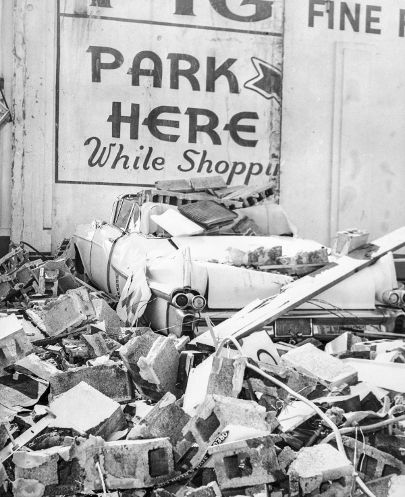 After collecting hundreds of storm survivor stories to help shape “A Deadly Wind: The 1962 Columbus Day Storm,” I had this reoccurring thought: It’s a wonder more people weren’t killed or seriously injured."